The July issue of NARC. is out now, available from over 200 outlets across the North East. 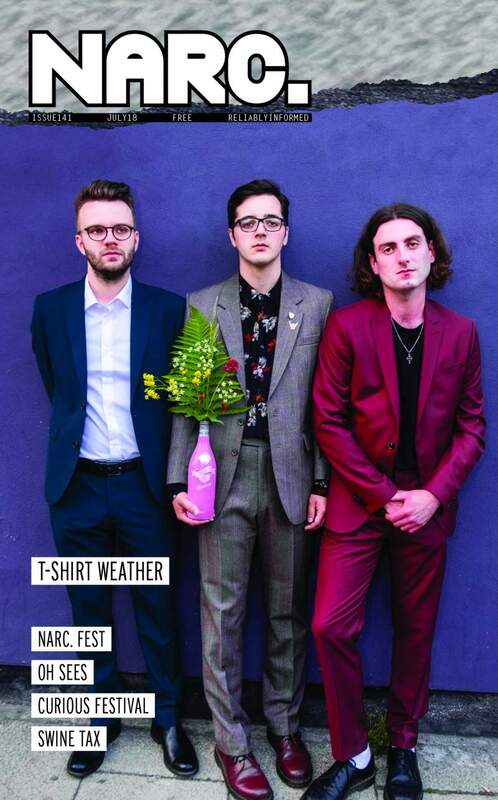 This month’s cover stars are Durham pop punk trio T-Shirt Weather. Linsey Teggert talks to them about being influenced by ABBA, writing songs about cars and how Stanley Kubrick faked the moon landings. Exclusive images courtesy of Nick Wesson. You can tell summer has come around, it’s well and truly festival season! We have previews of Mouth of the Tyne festival; Mavis Staples at Boiler Shop; Summer Streets; BRASS Festival; Bodies on Everest at Trillians; House And Land at The Cumberland Arms; Folkish Fusion at Majestic Theatre; Death in Vegas at Boiler Shop; Northern Electric festival; Sinister Six at O2 Academy; FRESH at Cobalt; Talent Show at The Fishermans Arms; Gosforth Civic Theatre Beer Festival; Cosmic Dead at The Cluny and much more. The Culture section is similarly festive, with features on Jesterval at Live Theatre and Stockton Contemporary arts festival, plus profiles of Bonnie & The Bonnettes and performance cabaret night PUG. Previews of Quentin Crisp: A Naked Hope at Northern Stage; Ella Mesma at Dance City; South Tyneside Comedy Festival; Louisa Hodgson at Hatton Gallery; All of Me at ARC; Funny Way To Be fringe previews; Tall Ships celebrations in Sunderland; Redhills Revolution at Redhills Durham; Folk Horror Revival presents Witch Cults at Star & Shadow Cinema; Geordie Jazz Man screening at Tyneside Cinema; Before The Edinburgh Fringe at Alphabetti Theatre; Masala Festival across the region and much more. Plus reviews of Frankie Vah at The Witham, Lizzie J Klotz at Dance City, Fleabag at Live Theatre, Doug Stanhope at O2 Academy and Tim Key at Northern Stage. There’s even more festival action courtesy of the massive LGBTQ Curious Arts Festival comes to a host of venues across the region; did we mention our very own NARC. Fest is taking place this month too? Saturday 7th July sees the Ouseburn Valley filled to the brim with top notch music, all for free! Find out more with our comprehensive feature. Plus, Sage Gateshead welcome back their celebration of Americana, roots, blues and country at SummerTyne Americana festival. Interview-wise, Ben Lowes-Smith talks to Hefner frontman Darren Hayman about resurrecting the band’s debut album; Sammy Sadler talks to musical genius John Dwyer ahead of Oh Sees’ Newcastle gig; Lee Hawthorn talks to Teesside grime veteran Blitz about his upcoming release, The Law Of Attraction; Damian Robinson chats to Andrew Mahon about resurrecting post-everything instrumental band, Sefelt; Ali Welford talks to Newcastle indie trio Swine Tax about their new EP, working with Hookworms’ MJ and music scene micropolitics; Sammy Sadler talks to Kathryn Tickell about imbibing ancient sounds with contemporary exploration in her new project, The Darkening; and musician Gem Andrews lets us peek at her record collection in the Mixtape feature. We feature demo reviews by Give Me Sleep, Mr Comfortable, Julian Alfombra, Tobias & The Lion and LoGOz; there’s reviews of albums by Ty Segall & White Fence, Smokescreens, Bodega, Trust Fund, Simon Love and more; plus track reviews of Leddie MC, Treasurer, Plaza, Talent Show, Martha Hill and many more. We bring reports from the front row of live gigs from Bilge Pump at Little Buildings; Ty Segall & The Freedom Band at Boiler Shop; Rival Consoles at The Cluny; Ill at Head of Steam; Echo & The Bunnymen at Sage Gateshead and many more.